Shared Topic: What’s your headcanon? If I were to write about all of my headcanon, it would probably be enough to fill a small book. Or at least an entire short story. Headcanon is actually one of my favorite parts of WoW. I like taking this world that we were given by Blizzard and fleshing it out in my mind to fill in the gaps, yet still make sure it stays appropriate to the world. I think it’s probably good practice for me, since I’m notoriously bad at world building. I love telling characters’ stories, but making up an entire world is daunting to me. WoW gives me just enough freedom and creativity that I can be creative and not get overwhelmed. The world we are given is much smaller than the world my characters live in. In game, the world is understandably small (even though as far as video games go, it’s actually pretty huge). But when you think about it, it doesn’t make much sense that you should be able to fly from the northern most part of a continent to the southern most in less than twenty minutes. Well, I suppose it could make sense, but that would mean that this is an extraordinarily small world. With the mix of cultures and history in Azeroth, the setting seems too small, and so I choose to ignore what the game tells us in this regard. I’ve written about this before, but I think it’s worth talking about again here, especially since it tends to be one of those things where people who aren’t used to writing with me get a little confused. For example, I like to think that Quel’Thalas is much bigger than Eversong and Ghostlands would have you believe. Eversong itself I imagine taking at least 45 minutes to walk from Silvermoon to the river that divides it from Ghostlands. And Ghostlands I imagine being much larger and vast. I generally say that I think Quel’Thalas is about the size of New Jersey, which gives me the chance to write in places that don’t exist in game, such as villages, other Amani settlements, outposts, and many other things. In order for the elves to stay as isolated as they’re supposed to be, they would need much more room to nurture their exclusive society. Along with this, I like to think that travel is much more difficult than it is in the games. I don’t really enjoy including portals nor long distance teleportation in my writing. I feel like traveling back and forth between contiments should be a huge time and financial investment, with voyages (by air or by sea) taking days if not weeks. I’ll continue with this idea in Mists as well. 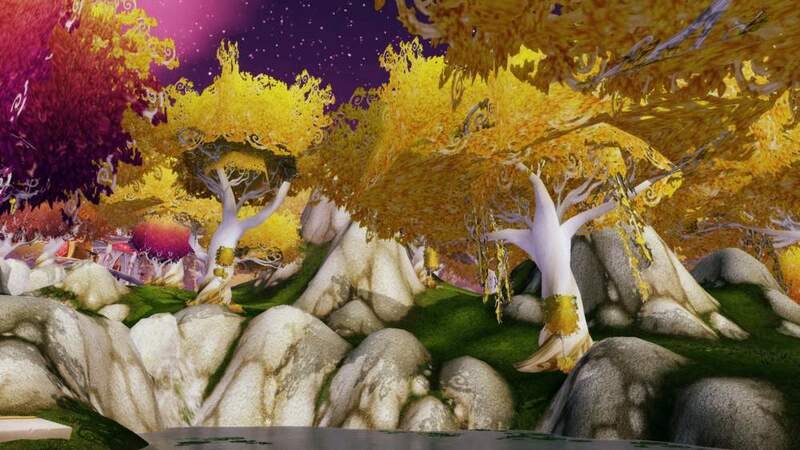 Once my characters go to Pandaria, they are going to be there for the long haul with very infrequent trips back to Kalimdor or Eastern Kingdoms, if there are any at all. Even though WoW is a strange mix of fantasy, sci-fi, and steampunk, I like viewing travel, at least, with a bit more of a primitive stance. It makes the world feel more real to me. I love writing about Silvermoon. It’s such an interesting fantasy city, with arcane replacing technology and a culture that has slipped into decadence. I love imagining different little corners of it that the game never gives us. 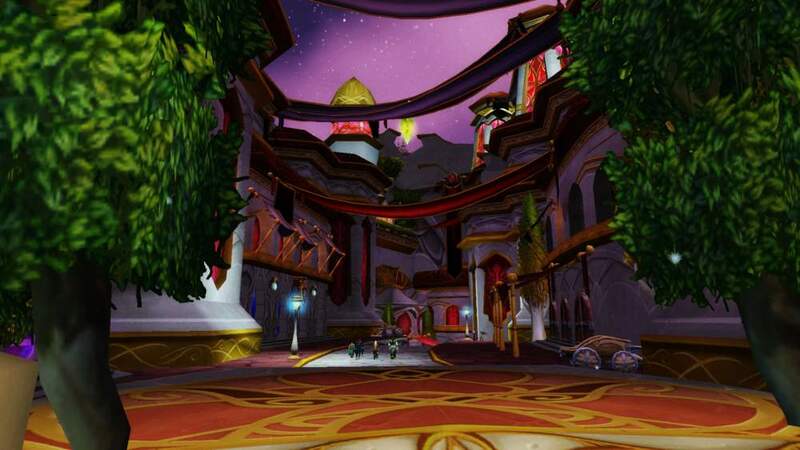 In game, Silvermoon has no residential areas or places to live at all. In my head, there are more districts, and like the world, I imagine the city to be much much larger than it is in game. There’s a neighborhood for just the noble types, for the merchant class, and more. Koralie has a flat in Murder Row above an apothecary shop. In my head Murder Row is more of a neighborhood than a tiny street. Within it there’s plenty of crime, but also a lot of fun. I had this idea that Koralie, generally rejecting traditional Silvermoon society, probably would rather shoot herself then go spend a night out drinking at the Silvermoon Inn, so I made a tavern called the Alibi Room instead. It’s a rowdy place with loud music (think Irish pub music with a splash of rock and turned way, way, up). Typical blood elves would sneer at the place, but I imagine it being great fun. At least half the time that I write about Koralie being there, she ends up getting into a brawl, which everyone generally approves of. I take my cues from other decadent societies, like the height of the Roman Empire to imagine the political climate of Silvermoon. Without their king and with a Regent Lord who never wanted the job, I imagine the political jockeying much be intense. I love writing about the corruption that festers beneath the city’s shining surface. From corrupt court officials to blood knight generals that are only too happy to use their purses to manipulate and control those outside of the order, the corruption of Silvermoon is one of the main plots of my writing. The Blood Knights are another place where I have quite a lengthy headcanon. For all the development they received in BC (when I wasn’t even playing!) they haven’t received much since then. I think this is rather a pity, especially considering the plot of Wrath would have been a nice place for them to shine. And so I have an elaborate list of all the general, commanders, many knights, and more within the order, along with their basic personalities and the connections between them. With my main RP character being a blood knight, I really had to flesh out the order so that I could write about it. Traditional military or not, it’s still military. I wanted to stay true to that. I find that for whatever reason, I end up writing about food and meals fairly often, which begs the question, “What does this culture eat?” For blood elves, I tend to think they’re cooking a lot of French type food, so I mostly pull from that cuisine when I need an idea for a quick meal. Though once I did write a scene where someone was cooking an elaborate meal of salmon with raspberry mead sauce which is definitely not French. Still sounds elfy though. Similar to that, I like to imagine that an elf speaking Orcish is quite hilarious with their graceful accent wrapping over those harsh words. Say “Lok’tar Ogar!” with a French accent. No really, do it. That’s what I imagine Blood Elves sound like to the rest of the Horde. This is another thing I’ve mentioned before, but I love thinking about background for the herbs of Azeroth and Outland. In my head, peacebloom is similar to tobacco. Sungrass is similar to pot. Stormvine shares properties with eleuthero. And Azshara’s Veil got its name from when the Queen herself demanded that thousands and thousands of the gossamer petals from the delicate, short-lived plant be fashioned into an entire outfit for her. Imagine her fury when the servants were only able to make her a veil! I actually do intend to do the other blog I mentioned before about the herbology of Azeroth, just because I think some of the things I’ve come up with are amusing and could possibly help others who are writing about this world. I could really go on and on with all of the headcanon rattling around in my mind. I’d be curious to know if this is something that only people who write about the world do, or it others who play the game make up strange little facts about it as well. Where are the best vineyards in Azeroth? Who makes the best chocolate? What sort of fairy tales do dwarves tell their children? Do you have a story for the nice tauren lady that repairs your armor? Maybe your goblin priest is part of the Church of the Coin.